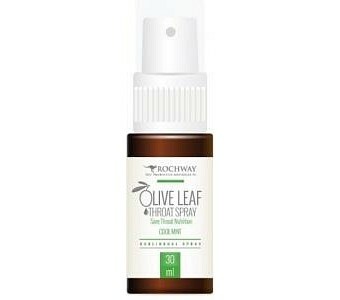 Rochway Olive Leaf Throat Spray in an effective antioxidant that regulates your immunity system to be healthy and promotes seasonal wellness during cold seasons. Research has shown that 2-6 sprays of Olive Leaf are effective when getting rid of a sore and dry throat. This probiotic provides powerful anti-viral and anti-bacterial properties in every spray and guarantees good oral hygiene. Made with natural peppermint for a refreshing taste No sugar added No alcohol added Gluten free Non drowsy Colour free Ingredients: Olive Leaf Extract (Olea europea), Papaya fruit enzymes, Sage (Salvia officinalis) leaf extract, Peppermint (Mentha piperita) oil, Marigold (Calenda officinalis) flower dry, Clove bud oil, Glycerine, Menthol, Lemon flavour, Bio fermented liquid base.